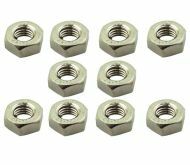 Pack of 10 bright zinc plated (BZP) hexagon nuts with 10mm / M10 metric thread. M10 x 40mm penny washer (10mm hole x 40mm diameter) - BZP Sold in single units. M6 x 30mm (6mm hole x 30mm diameter) penny washer - BZP Sold in single units. M8 x 35mm (8mm hole x 35mm diameter) penny washer - BZP Sold in single units.